Trustix Merdeka was the first Indonesian Linux distribution. The main idea was to provide a desktop Linux distribution, which would be secure out of the box, easy to install, include minimum packages and multi-lingual. One of the main focus of Trustix Merdeka was mobile computing. Update: The distribution's web site became unavailable in March 2003. Rate this project Glen MacArthur has announced the release of AV Linux 2018.6.25, an updated build of the project's Debian-based distribution featuring a "real-time kernel" (with the PREEMPT_RT patch) and a large collection of audio and video applications. This version brings un updated 4.16 Linux kernel and improved support for newer AMD video cards: "AV Linux 2018.6.25 has been released. The April AV Linux 2018.4.12 release had a lot of improvements and updates with regards to the audio and video applications, but some improvements needed to be made for systems with UEFI booting and systems with recent AMD video display adapters not covered by SGFXI. I personally have no UEFI (or AMD) computers to test with, so I could only use VirtualBox for UEFI testing. Thanks to bug reports from a few users and several fixes provided by a forum member, I think many of the issues for actual hardware UEFI machines have now been addressed. If you have already successfully installed and updated AV Linux 2018.4.12 then you will not really need to be concerned with the updated June ISO images." See the full release announcement for more information. Download: isotester-avl64-2018.6.25.iso (3,558MB, SHA256, pkglist, username: isotester, password: avl64), isotester-avl32-2018.6.25.iso (3,402MB, SHA256, username: isotester, password: avl32). AV Linux is a versatile, Debian-based distribution featuring a large collection of audio and video production software. The distribution's latest update is AV Linux 2019.4.10 which introduces a number of fixes and represents the project's last version to run on 32-bit hardware. "This release is basically an update of the ISO that fixes a couple of annoying bugs from the 2018.6.25 release with some notable updates and additions. It will mark the last release based on Debian Stretch and sadly it will also be the last release of the 32-bit version. Future AVL development will focus on Debian 'Buster' and 64-bit only. In the meantime I think this 2019.4.10 version will provide a fast, stable well prepared platform for AV Content creation for quite some time. Changelog: Refreshed expired repository keys for WineHQ and Spotify. Updated and fixed repositories for new Cinelerra-GG site. Updated and synced all Debian and third-party repos (including KXStudio). Fixed VirtualBox Guest Additions removal script to allow /etc/rc.local to remain executable and enable automount of external drives. Fixed missing 'linvstconverttree' in LinVST. Removed some obsoleted udev rules." Further details can be found in the project's release announcement. Download: isotester-avl64-2019.4.10.iso (3,662MB, SHA256, pkglist). The AV Linux distribution is a Debian-based project which features many applications to assist the user in working with audio and video formats. The project has released a new version, AV Linux 2016.8.30, with a long list of changes: "Fixed UID/GID issue and restored live and installed UID/GID to '1000'. Updated to 4.4.6-RT kernel with fixed 32-bit app support and VBox module building support. Enabled running shell scripts by clicking in Thunar to ease installing Ardour and Mixbus bundles. Fixed WinFF presets for aac encoding. Added some module configurationss for AMD video cards and modesetting. 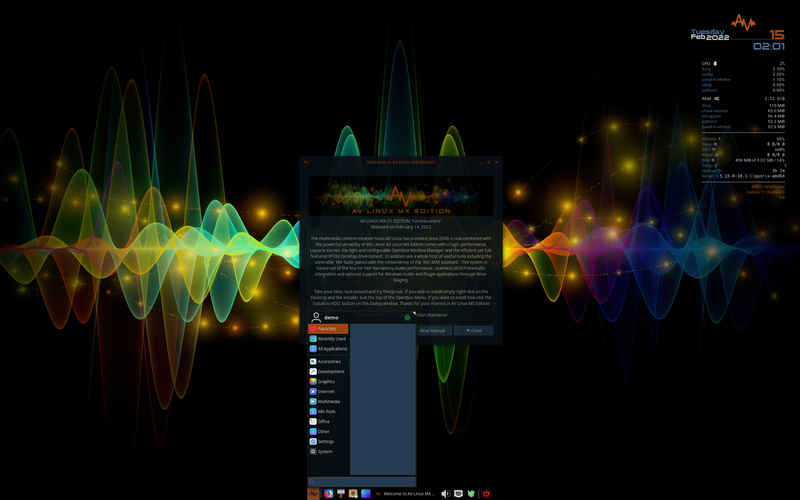 Complete new Zukitre-based theme necessitated by GTK+ 3.20, changing its API and breaking older GTK+ 3 themes. Complete new Hooli theme for AVL 32-bit. Complete removal of Kdenlive and KDE 5 runtime components, Kdenlive is simply not in a good place right now to feature on a live ISO image. Removed Openshot for the same reason as Kdenlive, it has great potential but just isn't there yet.. Complete removal of LibreOffice." A complete list of changes and a screen shot can be found in the release announcement. Download: isotester-avl64-2016.8.30.iso (3,341MB, MD5, torrent, pkglist, username: isotester, password: avl64). Glen MacArthur has announced the release of AV Linux 6.0.4, a new update of the project's Debian-based distribution with a collection of audio and video production software: "A new AV Linux 6.0.4 ISO image with important security updates and a lengthy changelog of updates and improvements has been released. For the best experience it is highly recommended to update to 6.0.4 by installing the new live DVD image. As a second option there is also a new updater script to update existing AV Linux 6.0.2 and 6.0.3 systems with the core updates and security fixes provided by 6.0.4. This release features the diehard4 theme, I'm sure folks will either love it or hate it, don't worry the complete former AVLinux Blue theme is still there. Changelog: updated Ardour3 builds to a special preview 3.5-3368 to prevent possible MIDI/Audio data loss; reverted JACK 0.124.1 utility scripts to use A2JMIDID; removed 'broadcom-sta-common' and its blacklist file to facilitate more Broadcom devices to work out of the box...." Here is the brief release announcement. Download: avlinux6.0.4-xfce410-pae-i386-en.iso (3,611MB, MD5, torrent, pkglist). Glen MacArthur has announced the release of AV Linux 6.0.3, a new minor update of the Debian-based distribution featuring a good collection of audio and video production software: "An unscheduled surprise updated for the AV Linux 6.0 series has been released, addressing a few bugs in 6.0.2, some important software updates and a move to a newer 3.10.27-PAE low-latency default kernel. Please note that an optional full pre-empt RT kernel with headers is also conveniently placed in the home folder for those who feel they may need it. For people using PCI Audio cards and FireWire devices the default low-latency kernels provide very good performance since AV Linux provides rtirq out of the box. Highlights of this release are the newly released Ardour 3.5.357 with critical bug fixes and fixed detection of linuxVST plugins, the latest JACK1 0.124.1...." See the full release announcement for a complete changelog. Download: avlinux6.0.3-xfce410-pae-i386-en.iso (3,041MB, MD5, torrent). Glen MacArthur has announced the release of AV Linux 6.0.2, a new build of the project's Debian-based distribution with a large collection of audio and video production software: "This new 6.0.2 version contains significant changes including a complete new customized Xfce 4.10 desktop environment, the 'pipelight' browser plugin giving access to DRM Silverlight content (i.e. Netflix) through your web browser, embarrassingly copious amounts of great LV2 audio plugins, updated FFADO drivers, additional handy Nautilus scripts, exfat-fuse support, MTP smartphone and tablet support, updated and improved documentation, LibreOffice 4.1, and the very best multimedia content creation applications all updated, tested and provided ready to use. Enjoy the latest Ardour, Mixbus (demo), linuxDSP (demos), Qtractor, Carla, DISTRHO plugins, X42 plugins and much more." Read the rest of the release announcement for more information and a screenshot of the default desktop. Download: avlinux6.0.2-xfce410-i386-en.iso (2,960MB, MD5, torrent). Glen MacArthur has announced the release of AV Linux 6.0.1, an updated version of the Debian-based distribution with a collection of audio and video production software: "Out of the uncertainty of the successful AV Linux 6.0 release an unexpected 6.0.1 update has arrived. What began as a minor update to bring a few bug fixes and fresh releases of Ardour 3 and Kdenlive to the DVD image has ballooned into a major update encompassing many of the main applications and bringing the best of what is new and happening to Linux audio and video enthusiasts. Changelog: updated to Trulan's 3.6.11.2 Linux kernel with Yamaha THR10 patches and USB 2 audio clock switching patch; complete new 'Dozer' theme and graphics; two new menu sections for audio and video utilities...." Continue to the release announcement to read the complete changelog. Download the live DVD image from here: avlinux6.0.1-lxde-i386-en.iso (3,115MB, MD5, torrent). Glen MacArthur has announced the release of AV Linux 6.0, a Debian-based distribution geared towards media production: "After a very turbulent development period AV Linux 6.0 is finally here. This will be the final release of AV Linux for a variety of reasons however don't stop reading at the word 'final', this is a state-of-the-art release that culminates over 5 versions and 5 years of experience and refinement into the best release to date. Changelog: update to Linux kernel 3.0.36; update to X.Org from 'Squeeze' backports; cleaned up and improved boot with dependency-based booting; allow all users access to X server; rolled Qt stack back to clean 'Squeeze' version to solve breakages from Qt 4.8; new Control Panel; move to Nautilus file manager; added new Hydrogen drum kits; added Nitrogen...." Read the rest of the release announcement for a full changelog and screenshots. Download: avlinux6.0-lxde-i386-en.iso (2,523MB, MD5, torrent).